LSAW steel pipe manufacturing process is simple, its production efficiency is high and at low cost, the development of straight seam welded pipe is rapid. Therefore, the straight welding is mostly used in smaller diameter of steel pipe. 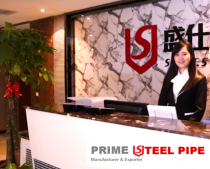 Today, as an excellent steel pipe manufacturer, Prime Steel Pipe will share the LSAW steel pipe manufacturing process in details for all of you. 16.Corrosion protection and coating: Qualified steel pipe will carry out corrosion and coating according to user requirements.